I have a sweet tooth as demonstrated by all these delicious dessert and sweet treat recipes in this blog. But it's a New Year and I'll be a year older (and wiser). So I'm opening my mind to healthier possibilities such as using organic ingredients and flour alternatives (for gluten-free desserts). 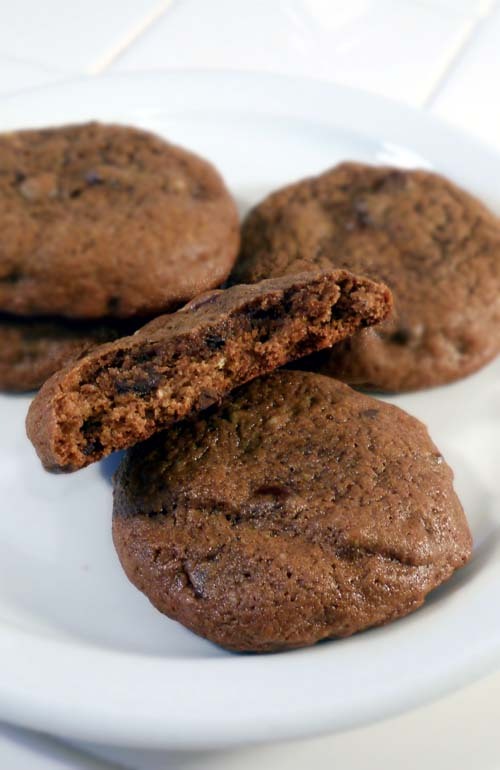 I got a hold of this recipe for gluten-free chocolate chip cookies. It's from the makers of Red Smoothie Detox Factor, a weight loss and body detoxification health plan. And they have plenty of desserts, breakfast, lunch, dinner and snack recipes using alternative ingredients that are healthier for you. Take these cookies for example. When I first saw the ingredients, brown rice flour or oat flour jumped at me. I'd never used these before. Doing quick research online, I'd come to understand that these ingredients are healthier for you than all-purpose flour. Gluten had been a rising source of health problems for many especially celiac disease. For this recipe, I'm using oat flour. Couldn't find it at my local Albertsons, but you can make them at home by simply grinding oatmeals in your food processor. The instruction video that I used is below. Also, instead of 1/2 cup cacao powder, I'm using 1 cup Hersheys dark cocoa powder because that's all I had left and wanted no leftovers. Because of this, the cookies are darker (and probably more chocolatey) than what the author had likely intended. Lastly, I'm using Hersheys dark chocolate chips instead of dark chocolate bars that had to be cut into chunks. Tastes great! Preheat the oven to 350 degrees Fahrenheit and line two cookie sheets with parchment paper or silpat liners. Place half the chocolate chips in a glass bowl and melt in the microwave for 45 seconds. Stir. If not completely melted, wait 20 seconds or so and microwave for another 30 to 45 seconds. Set the bowl aside. In a large mixing bowl, combine the eggs and olive oil with the sugar. Beat, either with a mixer or a wire whisk, until well-blended. Add the vanilla and melted chocolate, stirring or blending constantly until the mixture has an even texture. Add the oat flour, baking soda, cocoa powder, salt, and remaining chocolate chunks to the bowl and mix until all combined. If you aren’t using a mixer, swap your whisk for a wooden spoon or a stout rubber spatula. Use a large spoon or a medium cookie scoop to divide the batter into 24 equally sized portions on the baking sheets, placing the cookies about 2 inches apart. Bake for 10 to 12 minutes and allow to cool. Store in an airtight container. The cookies are suprisingly great. Smooth texture, though as can be seen from the pic above, there are some bits of oatmeal clumps. Perhaps I have to do a better job grinding them next time. Or just look for a store around here that sells them.